This entry was posted in Community, Events and tagged open house on April 18, 2013 by Wire Eagle. 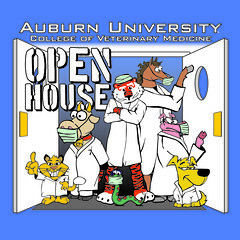 AUBURN UNIVERSITY – Auburn University’s College of Veterinary Medicine will hold its annual open house on Saturday, April 20, opening its facilities to the public to showcase the variety of professional opportunities available and allow people to learn more about animal care and health. The free student-organized event, from 8:30 a.m. until 2 p.m., features a variety of educational and fun activities for all ages on the college’s campus at 1130 Wire Road. “Open House is a wonderful opportunity for those who love animals to come and get an inside view of the College of Veterinary Medicine,” said Kris Street, an outreach programs administrator with the College of Veterinary Medicine. This entry was posted in Events and tagged College of Agriculture, extension, open house, plants on October 17, 2012 by Wire Eagle. AUBURN UNIVERSITY – Greenhouse tours, a presentation on permeable pavements and hands-on activities will be part of the lineup when the Alabama Agricultural Experiment Station’s Plant Science Research Center hosts a free public open house and rainwater-gardening class Tuesday, Oct. 30, from 2 to 4 p.m. The center is located on the Auburn University campus at 75 Woodfield Drive. The tours at the center will be conducted from 2 to 3:30 p.m. and will spotlight several research projects under way in the greenhouses and research field – projects focused on such issues as integrated organic pest management; disease management for ornamentals, field crops and vegetables; and an evaluation of banana varieties. This entry was posted in Athletics, Campus Announcement, Community, Events and tagged a-day, Athletics, baja, open house on April 14, 2009 by Wire Eagle. AUBURN – Auburn University’s campus will be filled with activities Saturday, April 18, for football fans and other guests in town attending various events. Highlighting the day will be the A-Day football scrimmage at 1 p.m. at Jordan-Hare Stadium as new head coach Gene Chizik gives the public its first look at the 2009 Tigers. After the game, fans will be allowed on the field for an autograph session with the team. More information about the game, which is being presented by the U.S. Navy, can be found at www.auburntigers.com. Prior to the game, the Auburn Alumni Association will host its Minority Alumni Involvement Now, or MAIN, A-Day tailgate party from 10:30 a.m. to 12:30 p.m. on the Nichols Center lawn near Jordan-Hare Stadium’s west entrance. More information is available at www.aualum.org. The Student Alumni Association and the Auburn University Parents Association will have their Spring Family Day Fish Fry from 11 a.m. to 2 p.m. on the Wallace Center lawn. Details are at www.auburn.edu/parents/spring09.html.